Los Angeles County is blessed with a diverse population, a dynamic economy, a beautiful coastline, and a dedicated community of organizations and individuals invested in making it a better place. The county, like many other US counties, also faces some serious challenges in terms of supporting residents to live fulfilling, productive lives. So how is Los Angeles County doing, and how does it stack up against other communities? That’s a question that communities across the United States often ask themselves, and the yardstick we use to answer it depends on what we value. Traditional measurements of development often tell us how the economy is doing. California’s Gross Domestic Product (GDP) per person of $59,000 is virtually the same as that of Wyoming. But there is no doubt that the assets and challenges of each state are unique and by this measure, we fall short of capturing how people are doing. A more holistic approach for measuring people’s well-being brings us closer to finding a better answer. In 1990, a ground-breaking report from the United Nations fundamentally shifted how the world understood development. “People are the real wealth of a nation,” the seminal Human Development Report opened. “The basic objective of development is to create an enabling environment for people to enjoy long, healthy and creative lives.” The influential report introduced a human-centered approach to development and a new tool for measuring progress, the Human Development Index (HDI), a composite index reflecting three essential ingredients of well-being and opportunity: a long and healthy life, access to knowledge, and a decent standard of living. Development around the world would no longer be measured exclusively by GDP per capita, but by what an ordinary person could do or be. Human development, the brainchild of Pakistani economist Mahbub ul Haq, is defined as the process of enlarging people’s freedoms and opportunities and improving their well-being. At the World Bank in the 1970s, and later as minister of finance in his own country, Pakistan, Dr. Haq argued that existing measures of human progress—GDP in particular—failed to account for the true purpose of development: to improve people’s lives. Dr. Haq often cited the example of Vietnam and Pakistan; both countries had the same GDP per capita—around $2,000 per year—but Vietnamese were living eight years longer than Pakistanis and were twice as likely to be literate. Together with Nobel Laureate Amartya Sen and other gifted economists, Dr. Haq published the first U.N. Human Development Report, which ranked countries using the HDI. Every year since, the United Nations Development Programme office has published a Human Development Report. The world quickly adopted the HD Index as the gold standard for quantifying development. 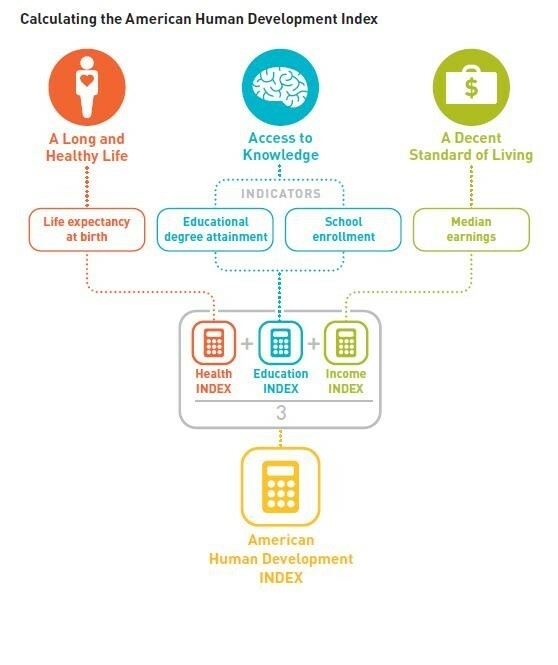 Many countries made the HD Index an official measurement of well-being; others began publishing their own annual national human development reports. One notable exception was the United States. In the wealthiest nation on Earth, the concept of “development” had been typically regarded as exclusive to developing countries, irrelevant to our developed nation, and progress in the United States had been defined largely in purely economic terms, with GDP per capita as one of the most common yardsticks. This, however, would soon begin to change. In 2008, important conversations about inequality and access to healthcare were surfacing to the mainstream; in the midst of the financial crisis, there was growing demand for a new way of understanding progress beyond GDP. Two former career U.N. professionals, equipped with years of experience working on development issues, saw an opportunity to introduce the human development approach to the United States. Nearly two decades after the U.N. released its first Human Development Report, Sarah Burd-Sharps and Kristen Lewis published the first national human development report for the United States. 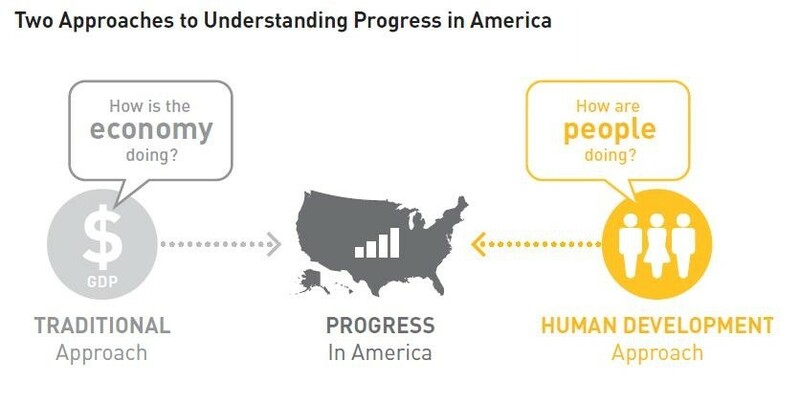 The Measure of America: American Human Development Report, 2008-2009, the first of its kind, introduced the American Human Development Index (AHDI), an adaptation of the HD Index for the United States. 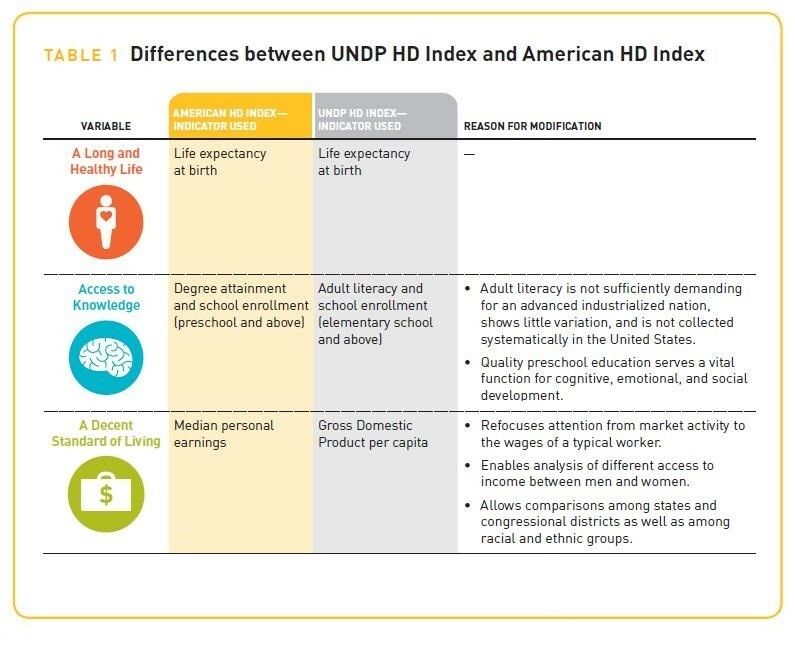 The American HD Index measures the same three fundamental areas of well-being—a long and healthy life, access to knowledge, and a decent standard of living—using indicators more appropriate for an affluent, developed nation (see Table 1 for more details on modifications). Burd-Sharps and Lewis have since published three more national human development reports for the United States and several more for individual states and counties—including California, Marin County, and Sonoma County. In 2008, former French President Sarkozy convened a commission to outline the limits of GDP and to explore alternative measurements for social progress. Their report gave momentum to the “Beyond GDP” movement and It is now conventional wisdom that GDP does not tell the full story, and that measuring things like the health, education, and the standard of living of ordinary people are just as important as market growth. Now more than ever, the human development approach and the AHDI can be powerful tools to assess how Americans are doing and design policies aimed at improving ordinary people’s lives. Today, Measure of America, a project of the Social Science Research Council headed by Burd-Sharps and Lewis, creates easy-to-use yet methodologically-sound tools for understanding the distribution of opportunity in America, using the human development approach as its conceptual framework. The project produces an annual national human development report and similar reports for states, counties, and cities featuring its hallmark American HD Index for different populations, as well as thematic reports on particular well-being issues like youth disconnection and discriminatory lending, and interactive websites like DATA2GO.NYC. Our work has already succeeded in making well-being data easily-accessible for communities, informing policy, and influencing philanthropic decision-making. With funding from a consortium of Los Angeles-based philanthropic partners and the Los Angeles County Productivity Investment Fund of the Quality and Productivity Commission, Measure of America is hard at work on A Portrait of Los Angeles County. The report, slated to launch in November 2017, will examine the distribution of well-being and opportunity in the county, putting Los Angeles residents at the center of measuring progress and well-being for cities, unincorporated areas, City of LA Community Plan areas and Council Districts, for racial and ethnic groups, women and men, native- and foreign-born, and other groups. 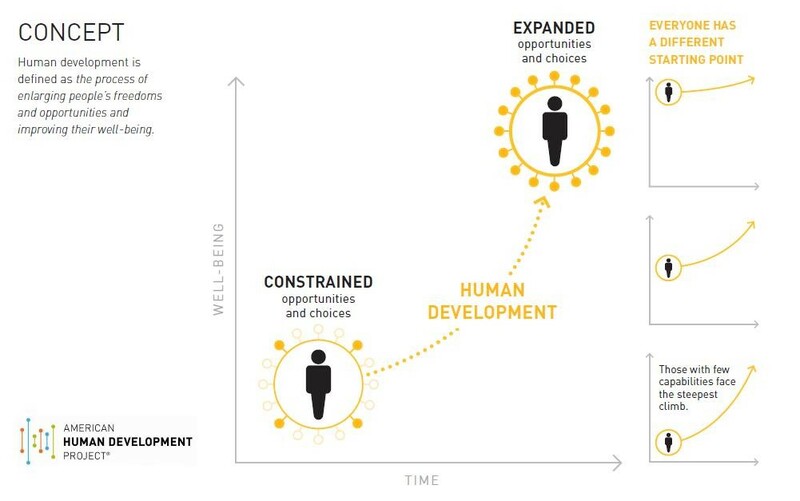 To learn more about the human development approach and find out how your community stacks up, visit our website at: www.measureofamerica.org.